Have you ever played a game that just feels right—a game where the controls and challenge immediately click, making playing it an almost instinctual thing? Rock Runners is that kind of game. The person that first emailed me about this level-based runner from Recoil Games said they thought I'd really enjoy this one, and I plan on paying close attention to their recommendations from here on out—they couldn't have been more right. From the first level I was completely hooked. I normally juggle three or four mobile games at a time, but Rock Runners kept me playing from start to finish. This is a fast-paced arcade platformer in which the goal is to get from one end of each gorgeous level to the other. The player character jumps and swings over obstacles, collecting gems to purchase power-ups, keys to unlock levels on each of the game's four hex-based planetary playfields, and fuel canisters required to blast off via the ship at the end of each playfield. You can play all 140 levels if you'd like, but the goal is to make it to the ship with the right amount of fuel—you can make a beeline, if you want to miss out on some amazing gameplay. Rock Runners is all about fluid movement. 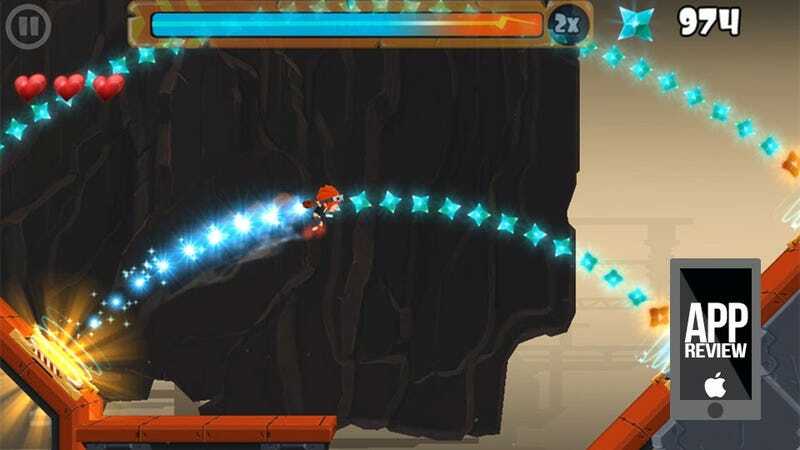 Each level, pieced together from a collection of obstacles tied to each planet's theme, presents a platforming adventure that, when performed perfectly, feels more like flowing than simply running and jumping and swinging from an energy beam. There are no hard stops, no awkward moments—a perfect run is a supremely satisfying thing. It's the kind of action that's hard to put down, the end of each level both a relief and a disappointment. The biggest disappointment comes at the end of the fourth planet, when there are no more levels to conquer and I'm left staring at a shadowy planet with a "coming soon" sign on it. It can't come soon enough.